BONTOC, Mountain Province – The Provincial Local Government Unit here recently released funds as financial aid to victims of a vehicular accident who are all from Mountain Province that took place last January 30 this year in Atok, Benguet. Governor Bonifacio C. Lacwasan, Jr., led a team from the Provincial Government last Thursday, May 17, to personally deliver the cash assistance in the form of checks to the victims and to the families of those who were killed during the accident. An amount of Php10,000 each was given to the immediate families of the victims who were killed while an amount of Php5,000 each was given to the passengers who sustained injuries. Gov. Lacwasan said that with the meager budget of the Provincial Government and the small amount of assistance will at least help augment the expenses incurred by the victims. “The amount maybe small and did not came earlier due to some beaurocratic processes, still, we hope that the victims will feel the presence of the government in guaranteeing support and intervention in times of tragedies and disasters,” he said. It could be recalled that a van that came from the town of Bauko, Mountain Province is headed for Baguio City fell into a deep ravine, seizing the lives of 3 individuals including the driver and left the other 5 passengers wounded. 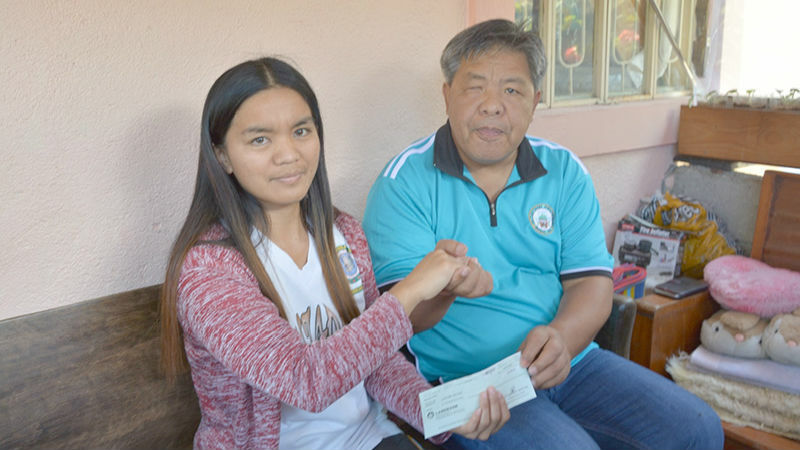 Eugene Balog-ang of Bila, Bauko, the husband of the deceased victim, Lourdes P. Balog-ang thanked the Provincial Government for providing financial assistance. A passenger who sustained injuries, Glenda P. Batawang, 41 and a resident of Guinzadan Norte also joined the other victims in expressing gratitude to the provincial local government unit. Meanwhile, Miguela P. Angwani of the Provincial Social Welfare and Development Office (PSWDO) emphasized on the cooperation of the Municipal Social Welfare Development Office of Tadian and Bauko for conducting a case study to support the distribution of the financial aid. She said that the giving of financial assistance is provided under Provincial Ordinance No. 258 that covers the guidelines for the provision of financial assistance to individuals or families in crisis conditions and those affected by natural or man-made disasters. Under the ordinance, the Provincial Government of Mountain Province through its PSWDO shall provide assistance to victims of disasters, chronically ill patients, abused or neglected children and adults and other individuals who are in extremely difficult situation.